While I certainly appreciate the advances in technology that have allowed us to have high-performance fishing gear, I have always also had a fondess for rustic, traditional gear. There’s something special about traditional, handmade gear that I just can’t resist. It could be nostalgia, but I think for me, it’s more about aesthetics. Modern gear is mass manufactured and has no personality. 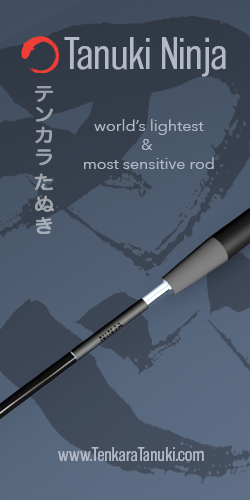 The manufacturing process has been perfected so that 100 rods that just came off the line are all identical. This makes it difficult for me to have any any affinity for a particular piece of gear beyond being a cold tool. But each piece of handcrafted gear is unique. Whether it’s a rod, a net, or a fly box, each piece is one of a kind. Each has its own variations and imperfections–its own soul. And I feel like part of the soul of the artisan who made it haunts it. If there’s anything that gives a “thing” value, that does. I’ve posted about several pieces of hand made tenkara gear that I’ve got, including my wooden fly box, bamboo fly box, moose antler line spool, wooden line spool, etc. 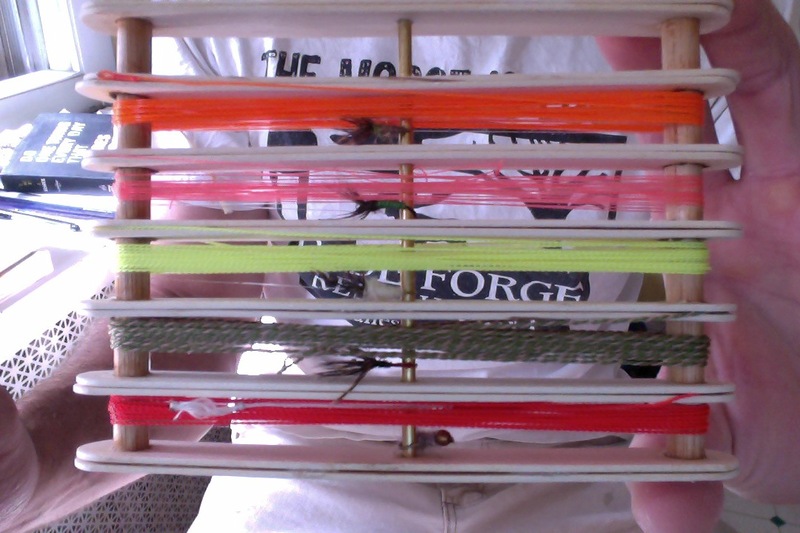 But now I have one more to add to my collection: a bamboo line winder from Tenkara Fly Shop. 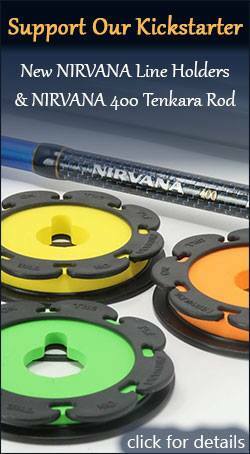 This winder is 6″ long by 1.5″ wide and will hold two lines. 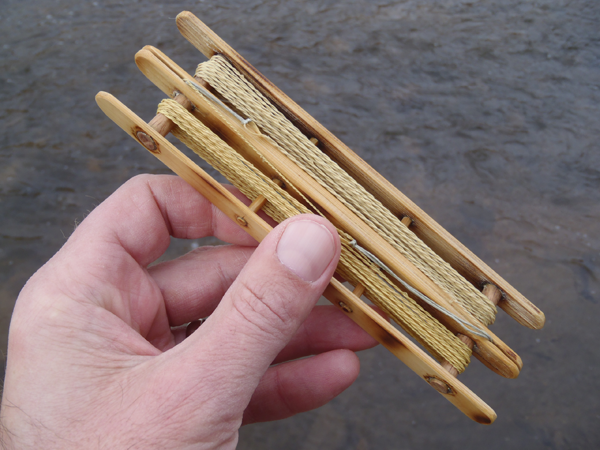 It has pegs to hold a fly as well as slots to secure the end of the lines. 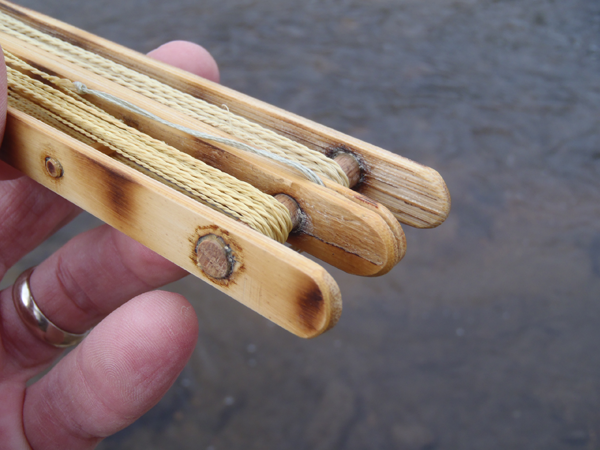 A long time ago, I wrote about another bamboo tenkara line holder I have but I like this one much better. For one thing, it’s a lot bigger, meaning you can wind the line faster. But the main thing I like is the aesthetics. The bamboo is lighter colored with dark accents and is beautiful to look at. Holding it in your hand almost makes you feel like you’ve stepped back in history. Since I normally fish level lines, spools are more practical. Because they’re round, spools don’t put kinks in level lines like winders do. 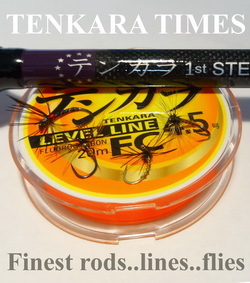 So to me, winders like this are more suited to more supple, furled lines like the Kevlar lines from Tenkara USA. On the other hand, (as Karel recently pointed out to me) you still have to stretch out a level line on a spool anyway so if the winder puts kinks in your line, it’s really the same process as if you had used a spool. So maybe this is a non-issue. At any rate, I think this line holder is as functional as it is beautiful. There’s always a delicate balance between aesthetics and practicality when you’re talking about gear like this. In this case, I think aesthetics wins. Cool! I like the bamboo. Mike, I think they have them available but they are switching to a new e-commerce system so it’s down temporarily. I would either email them or check back when they have the new system up. Agreed on the lack of character from the modern manufacturing process…but there is still one way to put character into those mass produced products: USE. The more you use the product, the more character it develops and the deeper your ‘relationship’ becomes with the product. That’s true of everything from fishing rods to bicycles to backpacks…and everywhere in between. Great point, Kid. A patina definitely adds character to gear and reminds you of all the adventures you’ve had with it. Hi Jason: Beautiful and very usefull, ¿where can i get one around here? impossible. Maybe during the winter make me one for myself. The guy at tenkaramushroom on etsy makes some very nice hand crafted line spools carved from red oak. They might be an option unless your heart is set on bamboo. I don’t think modern material gear gets a patina. That’s just dirt. 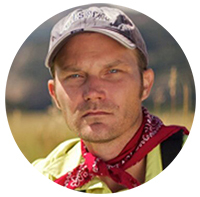 Jason I have been a fly fisherman for almost 25 years. 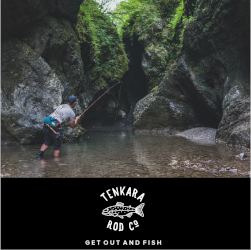 Just started following your tenkara site. 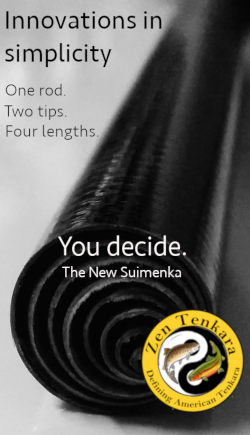 This is great stuff, like the minimalist aspect of Tenkara. Getting up to speed by reading and watching your videos, my style of flyfish for many years is changing. Thanks Roy. That’s great to hear! This inspired me to try to make one on the cheap.